Lucas Torreira will hope to continue a strong start to life at Arsenal against Leicester on Monday Night Football. Nick Wright examines his impact and finds out how a promising winger from Uruguay grew into the central midfielder Arsenal have needed for years. Of all the chants that rang out from the away end during Arsenal's 5-1 thrashing of Fulham, there was one which echoed around Craven Cottage particularly loudly. 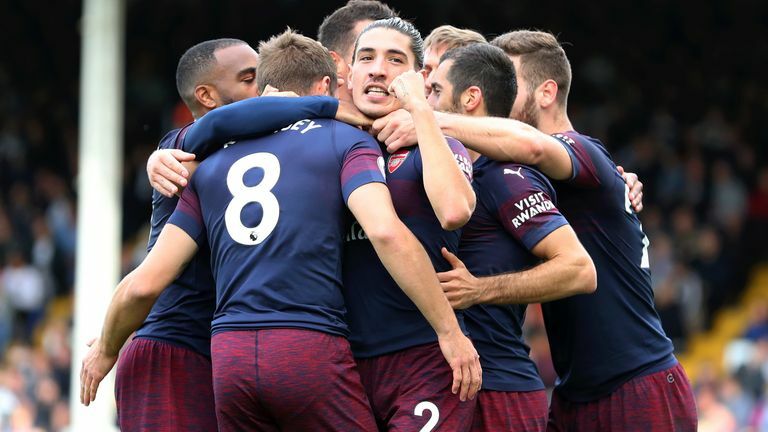 It was not aimed at any of their goal scorers, nor at Unai Emery, the man overseeing their ninth win in a row from the dugout, but at Lucas Torreira, the little figure scurrying around midfield. "He comes from Uruguay," it went. "He's only five foot high." The early evidence suggests it will get plenty more airings as the season progresses. Torreira is one of the shortest players in the Premier League, his 5'6'' frame evoking memories of the sadly departed Santi Cazorla, but his impact has been sizeable. From the moment he broke into Emery's starting line-up last month, it was clear he would stay there. Arsenal remain a work-in-progress under the new head coach - there are no quick fixes to the issues which undermined them for so long under Arsene Wenger - but with his knack for snuffing out danger, his defensive diligence and his calm distribution, Torreira certainly gives them something they previously lacked at the base of their midfield. In 548 Premier League minutes with Torreira on the pitch this season, Arsenal have scored 20 goals and conceded just three. In 442 minutes without him, they have scored nine goals and conceded 10. His presence is not the only factor but the pattern is not coincidental. Torreira's qualities were plain to see at Craven Cottage, where he made more interceptions and more ball recoveries than any of his team-mates and even won the highest percentage of duels. Only his midfield partner Granit Xhaka posted a higher passing accuracy rate. Torreira is proving an exciting discovery for Arsenal supporters but his fine start should come as no surprise. The 22-year-old impressed for Uruguay at the World Cup and before that he only missed five Serie A games out of 76 in two years at Sampdoria. In his final season there, he made more recoveries than anyone else in the division and ranked in the top 10 for tackles, interceptions and passes. "If Torreira were 1.8 metres tall, he would already cost 100m euros," said Sampdoria manager Marco Giampaolo in November. Giampaolo was exaggerating, of course, but Arsenal were not Torreira's only admirers. He had established himself as one of the best deep-lying midfielders in Serie A following his move from second-tier side Pescara two years earlier. There were reports of interest from Napoli and Inter Milan before he completed his £26.3m move to the Emirates Stadium. And yet it could easily have been a different story. Torreira has brought some much-needed balance and bite to Arsenal's central midfield, but when he moved over to Europe at the age of 17, he was a winger who had never even played in the position. In fact, he almost missed out on the opportunity altogether. "His move to Pescara is a curious story," Marcelo Piriz, Torreira's former youth coach at Montevideo Wanderers in Uruguay, tells Sky Sports. "I still talk about it with him now, because the truth is that he was not going to go. There were five boys from different age groups on the list to go for trials, but Lucas wasn't one of them. "I had a conversation with our sporting coordinator and I asked why Lucas wasn't going. He said that he was too small - that in Italy they had big players. I told him that Lucas would be fine. I told him that the boys who were going were all good, they all had the quality for it, but that in my opinion, Lucas was better than all of them. "I wouldn't say that conversation is what changed the sporting coordinator's mind, but maybe it sowed the seed. In the end, Lucas went and he was the only one who stayed." Torreira was playing for Montevideo Wanderers' U17s at the time, having moved to Uruguay's capital city from his hometown of Fray Bentos on the border with Argentina a year earlier. Back there, he had been playing men's football for a local side called 18 de Julio. "He had already played with men so coming here and playing with boys of 17 was easy for him," says Piriz. "Lucas was basically the same size he is now but it wasn't a problem for him because he had that experience of playing with men in the interior of the country. He coped fine with that. There were never any issues relating to his height." Torreira's early start in men's football helped him develop the grit and toughness - or garra, to give it its Uruguayan name - that he plays with today, but what stood out most about him at that age was his technical ability. "With me, he played as a winger or even a second striker because technically he was very, very good," says Piriz. "He was very good with both feet and he had a great shot on him too. We had also begun to work on the defensive side of his game but it wasn't the priority." It was only once he arrived at Pescara that the emphasis began to change. Torreira started out in Massimo Oddo's youth team, where the former World Cup-winning defender decided to convert him into a defensive midfielder. Then, when Oddo took charge of Pescara's first team in Serie B, he did not hesitate to take the youngster with him. The positional change was a challenge for Torreira, who also struggled with homesickness, but his natural intelligence and physical dynamism soon helped him blossom. In an interview with Sky Sports in July, Marcello Donatelli, Oddo's assistant at the time, described him as "tactically the strongest midfielder in Europe" after Sergio Busquets. Back home, Piriz followed his progress closely. "Lucas had a very important period of development in Italy, above all in the technical and tactical aspects," he says. "Tactically, we gave him a lot more freedom here because as I said he had very good technique. Over there, he improved a lot tactically because of course that is a big part of Italian football. "The result is that he is now a very intelligent and very complete player. In the press, sometimes he is portrayed as just a defensive player and a guerrero (a fighter), but those other attributes are important. He rarely loses the ball when he has it and he is an impressive finisher. At Sampdoria, remember, he took all the dead balls. He scored goals from free kicks." From winger to defensive midfielder, from Uruguay to England, Torreira's journey has been under-pinned by hard work and dedication. His role is not a glamourous one but he has embraced it. In Emery's press conference after the Fulham game, it was notable that he praised Torreira's "humility" and willingness to "listen and learn" every day. "He is a tremendous lad and luckily he has not lost his humility," says Piriz. "People from the interior of Uruguay are known for being humble and hard-working. He has brought that together with his talent and now we are seeing the result. He is adapting well on the pitch and, from what he tells me, it is the same off it." Arsenal will hope it continues in the weeks and months ahead. The biggest tests are still to come for Torreira, but his early performances suggest he could turn a long-standing problem position into a strength. On Monday night at the Emirates Stadium, it would be no surprise to hear Arsenal supporters sounding their appreciation again.